A great rule to set up for your family is if you take something out, you put it back. If you open something, you close it. If you throw something down, you pick it up. If you make a mess, you clean it up. The best way to enforce these rules is to stop all action until they are carried out. This is where hitting “pause” on the television can become a very effective tool! 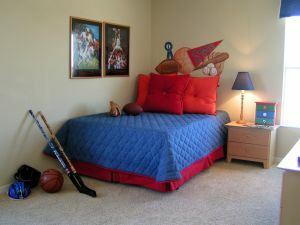 Everything should have a place in your home and that is especially true for what would be considered the “loose” items. For instance, when the family comes home and kicks off their shoes they should be a designated spot for each pair. That can either be in a closet or shoe rack by the door. Keys should go in a bowl by the front door as well so you know where they are at all times. Backpacks should be hung on a rack or taken immediately to the bedroom. Cooking in the kitchen is going to create a mess but that is a manageable mess especially if you adopt the principle of cleaning as you go. That same philosophy can apply to grocery shopping as well. Before you load up the refrigerator with new items, take out all the old stuff that hasn’t held up. Every time you put leftovers in the freezer you should label them with the date. Anything beyond six months should get tossed. Wicker baskets are a great decorative touch that help with organizing. They work on bathroom shelves, closet shelves and any other open space that you want to contain the clutter. This is where things like magazines, books, hats, towels and other loose items can go. Remember everything has a place. As you get your home organized you will discover a lot of things that can be tossed out. Everyone can contribute to that list for sure! Once you’ve amassed all that unwanted clutter you’ll want to call Junk King Orange County. These are the junk removal professionals that never met a pile of rubbish they could clear out. They’ll send over a team of movers and a big truck to take care of your junk removal. Getting your home organized starts with a call to Junk King Orange County. This entry was posted in OC Junk Removal and tagged clutter, home organized, Junk King Orange County, rubbish on June 27, 2017 by Junk King. Last updated June 27, 2017 .